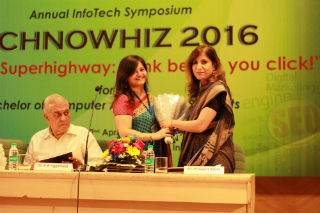 Jagan Institute of Management Studies, Rohini, one of the leading institutions of Information Technology and Management education has organized its Annual InfoTech Symposium “TechnoWhiz 2016” for BCA students. 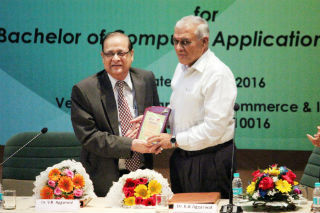 This year the symposium was held on 2nd April 2016, at Lakshmipat Singhania Auditorium, PHD Chamber of Commerce and Industry, August Kranti Marg, New Delhi-110016. We, the students and faculty of Jagan Institute of Management Studies, as part of a continuous process of learning through the interaction between corporate, students and academicians annually hold this half day InfoTech symposium from 8.30 a.m. to 1 p.m. In this symposium, we brought together students, faculty and invited guests from various disciplines to explore current trends in Information Technology. This year JIMS explored about the theme Information Superhighway: Think before you click!. Information Superhighway, the concept of worldwide massive networks of computers which are competent enough of transmitting all types of digital information at high velocity. This year, the topics for the symposium were- Ethical Hacking, Internet of Things (IOT), Digital Marketing, Search Engine Optimization (SEO), Wearable Devices/ Gaming Console, Cloud App. Development Tools, Wireless Sensor Networks, Impact of Social Media, Big Data Analytics. This year this symposium was headed under the guidance of Dr. V. B. Aggarwal (Chief- Convener), Ms. Aakanksha Chopra (Convener), Mr. Devesh Lowe (Co-Convener). 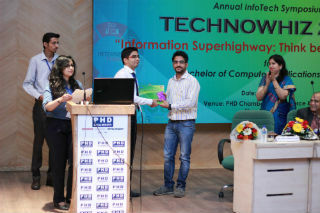 Around 15 faculty members from Department of Information Technology participated in this symposium, along with 276 students participated from JIMS Sec-5 Rohini, and 5 students from JIMS Bahadurgarh campus. Dr. Praveen Arora in her Welcome Address discussed that- "JIMS in its short history has won an enviable position in Delhi NCR due to a quality of students, teachers, learning resources and an environment. JIMS Emphasizes on making students leaders, with continuous involvement with industry. 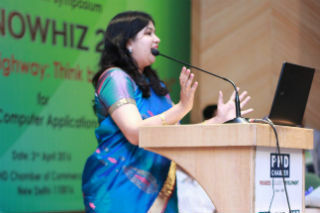 To support new technology, JIMS organizes events like symposium. She extended her gratitude to Prof. (Dr.) K.K. 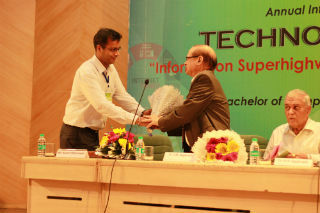 Aggarwal, and to Dr. V.B. 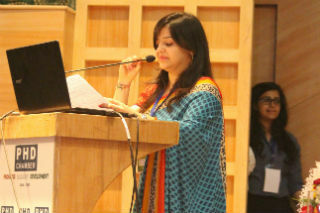 Aggarwal and all the speakers of the day." Dr. V.B. 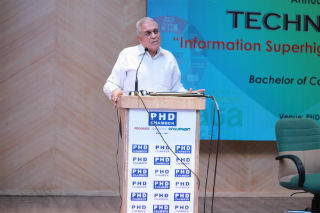 Aggarwal, Dean Infotech JIMS (Keynote Speaker- TechnoWhiz 2016) in his keynote Speech said that- "Data science forms a subset of big data analytic. Data science means drive hypothesis from raw data. We statically validate the hypothesis, with the certain degree of accuracy. Data science builds a model that filters the large data. This big raw data is divided into 2 parts, 2/3rd of data is used to build the model, 1/3rd is used to test the data. Using this model can bring down 3000 candidates down to 800 candidates. Makes the concept more clearly by taking the examples from the data science department of University of Berkeley, California. They have developed a mechanism to predict earthquake which will send the alert to your smartphone 5 seconds before the earthquake, and helps to predict traffic in the area." 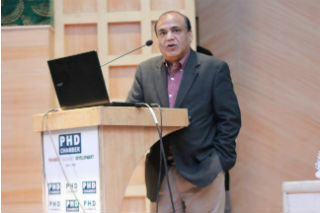 The chief Guest Prof. (Dr.) K.K. 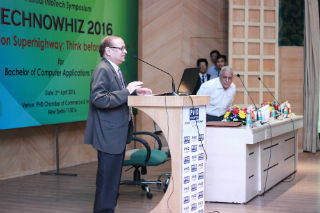 Aggarwal (Chief Guest –TechnoWhiz 2016) is the Chancellor of K.R. Mangalam University, Delhi-NCR. He also serves as the Member, Board of Governors, MITS Gwalior. 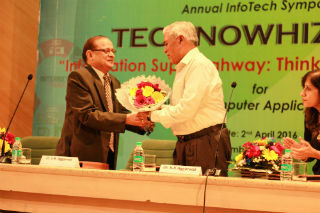 He has completed his tenure as Member, Board of Governors, IIT Patna and as Chairman, Board of Governors, MNIT Jaipur. He has been named the Man of the decade, man of the century and millennium. He started by saying that he has known Dr. V.B Aggarwal since the inception of IP University (1998) and praised him for his guidance. IP University started with 30 colleges, one of them was JIMS. JIMS has kept the pace of academic achievements. He said we are living in the era where if we are not able to get face to face teaching, we can get any information on our mobiles, which gives us the best of the services in every sector. The priority nowadays is to have the power supply and internet connection to have anything and everything from Information Technology. He also quoted that the young generation can live without fruits, but can’t live without the 3 screens: TV screen, computer screen, and mobile screen. More than 10,000 mobile phones are sold daily in India only. He also discussed Internet of Thing, soon every small machine we use in day-to-day life will have an IP address. Everything which we thought we can’t achieve or is not achievable has been achieved, only because of rapid changes taking place in Information Technology. He said he’ll be happy if computer science would be used by each and every person on the earth rather than only the computer science students. For the first time in the history of civilization, the Turing test has been passed by computers. He motivated students by saying that we have technologies but they are not being used properly, you just need to think of problems to be solved using them. 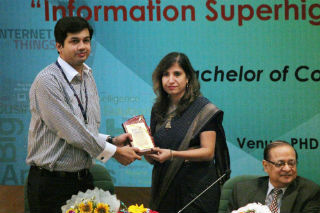 Mr. Karan Chaturvedi (Technical Speaker- I) is the City Technical Developer Evangelist, IBM Ecosystem Development Team. He was associated with companies like NTT communication, Huawei telecommunication, and Navisite, etc. for cloud initiatives. He started by saying that the world is moving towards Internet of Things. Age is not a barrier anymore, a 9 years old knows how to establish a connection with databases, how to pull data form. He also quoted that 2016 is the year of “Cognitive and Cloud Computing”. He discussed the building blocks required to develop an application, as everybody is looking for the rapid development of the application due to large competition. He gave the example of Cloud Application Development Tool, IBM Bluemix. He talked about DevOps which is the combination of development and operation. It is a tool which monitors the continuous development of life cycle of your project. Mr. Sanjeev Agrawal (Technical Speaker I) who is CIO- Executive Vice President (IT) at Apollo Munich Health Insurance Co. Ltd. He discussed the applicability of Technologies, future technologies, IOT(Internet of Things), big data and next big thing IT. In big data, he compared the scenario of last 40 yrs and today that how the data is used in the competent environment and this concept is broader in IT with new ideas like Uber where the whole cab industry is disrupted because of the new concept in IT and complete market. He talked about 3 characteristics of Big data is V3S of big data namely- Volume, Velocity, Variety. He also discussed big data tools like Hadoop etc. and data generated from various sources like mobile devices, cameras, scanner and others. What he talked about the Big Data is the concept where we have the hands-on experience with various tools available, play with them and understand and improve it. He talked about the internet of things, how to capture any environment. The various features Artificial Intelligence, delocalization, size consideration and addressing objects. He also talked about technologies and application of Big data like Barcode Readers, smartphones, Wi-Fi, and scanners. 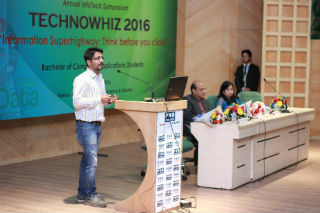 Mr. Nitin Manchanda (Technical Speaker- II) who is SEO Head at Askme.com. During this session, he mainly focused on Online Shopping and SEO, how the experience of online shopping is increasing day by day. He discussed paid marketing and organic marketing. SEO is related to Keyword Research which depends on user's indent. He also said optimization is done by performing research using different keywords and analyzing the behavior of the customer. In SEO of web pages, he talked about meta description, etc. Lastly, he said that content is the king, but now the content is the part of user experience and user is the new king. Then he concluded his session with a quote saying that: "Success is a journey and not a destination." Finally, the session ended with the Vote of Thanks given by Ms. Aakanksha Chopra (Convener) who said in a very motivated way that good things come to an end and every good event need a good team. She acknowledged entire JIMS family for being a constant support for the success of this event followed delicious lunch served at PHD house.